Nina discovered that her 3-year old has been having a difficulty of breathing lately. She could see suprasternal retractions and shallow respirations whenever her toddler breathes. The child also started having coughs and fever. Nina brought her toddler to a pediatrician who diagnosed her with acute nasopharyngitis. Upper respiratory infections include infectious processes involving any or all structures in the upper respiratory tract. The common cold is one of the most common infectious conditions of childhood. The primary concern for pharyngitis in children aged 2 years or older is that untreated GABHS pharyngitis may subsequently cause rheumatic fever. Primary bacterial pathogens account for approximately 30% of cases of pharyngitis in children. GABHS pharyngitis is spread via respiratory droplets through close contact. It has an incubation period of 2-5 days. 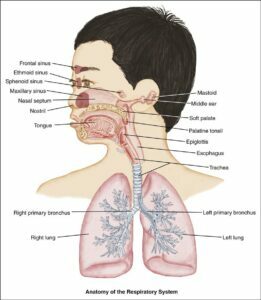 The bronchi and bronchioles become plugged with thick, viscid mucus, causing air to be trapped in the lungs. The child can breathe air in but has difficulty expelling it. This hinders the exchange of gases, and cyanosis appears. 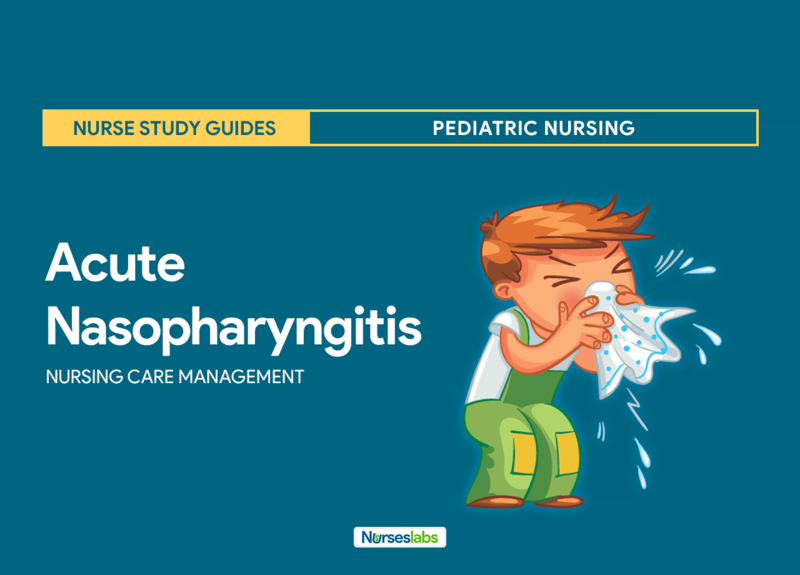 Pharyngitis is a leading cause of pediatric ambulatory care visits. Approximately 10% of children seen by medical care providers each year have pharyngitis, and 25-50% of these children have GABHS pharyngitis. Approximately 20% of asymptomatic children are chronic carriers of GABHS. According to the Red Book, from 1990-1995, approximately 48,000 cases of epidemic diphtheria were reported in the former Soviet Union and central Asia. The peak prevalence of GABHS pharyngitis is in children aged 5-10 years. Multiple entities can cause irritation and inflammation of the pharynx. Group A Beta-Hemolytic Streptococci (GABHS). GABHS is the primary organism of concern in most pediatric cases of pharyngitis because appropriate antibiotic therapy is effective and can eliminate the cardiac complications of rheumatic fever. Viruses. Viruses that may cause acute viral pharyngitis include the following: EBV (mononucleosis), rhinovirus, adenovirus, parainfluenza virus, coxsackievirus, coronavirus, echovirus, cytomegalovirus (CMV). 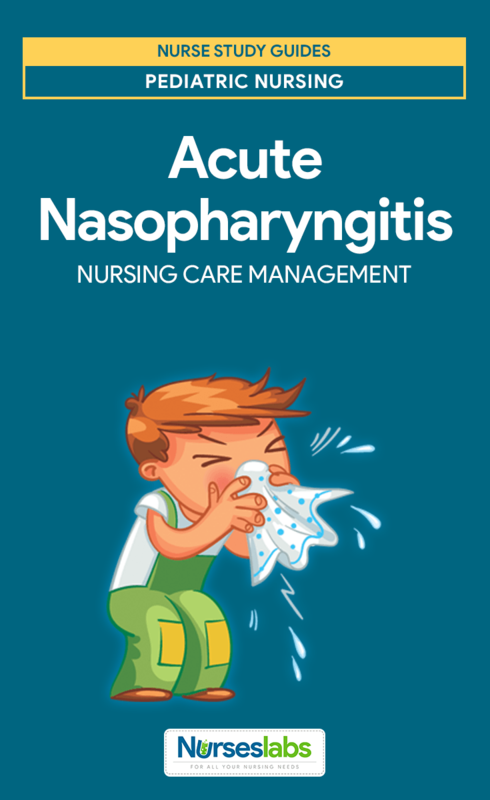 Symptoms of nasopharyngitis are more severe in infants and children than in adults. Fever. Fever is common, especially in young children; older children have low-grade fevers, which appear early and suddenly. Dyspnea. The onset of dyspnea is abrupt, sometimes preceded by a cough or nasal discharge. Cough. Symptoms include a dry and persistent cough. Nasal inflammation. Nasal inflammation may lead to obstruction of passages, and continual wiping away of secretions causes skin irritation to nares. Retractions. 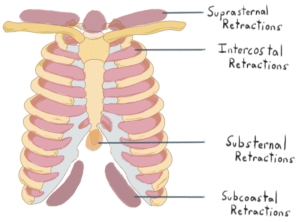 Suprasternal and substernal retractions are present. Barrel-shaped chest. The chest becomes barrel-shaped from the trapped air. Shallow respirations. Respirations are 60 to 80 breaths per minute.
. Viral pharyngitis is usually associated with sneezing, rhinorrhea, and cough. Diagnosis is made from clinical findings and can be confirmed by laboratory testing of the mucus. Throat culture. A throat culture remains the standard for diagnosis, though results can take as long as 48 hours; throat culture results are highly sensitive and specific for group A beta-hemolytic streptococci (GABHS), but results can vary according to technique, sampling, and culture media. Rapid testing. Most institutions and clinics have rapid testing, which is useful when immediate therapy is desired; rapid testing can be highly reliable when used in conjunction with throat cultures; several rapid diagnostic tests are available; compared with throat culture, such tests are 70-90% sensitive and 95-100% specific. Testing for viral causes. If Epstein-Barr virus (EBV) is considered, obtain a complete blood count (CBC) to detect atypical cells in the white blood cell (WBC) differential, along with a Monospot test (or another rapid heterophile antibody test). Radiography. Imaging studies are usually not necessary unless a retropharyngeal, parapharyngeal, or peritonsillar abscess is suspected; in such cases, a plain lateral neck film can be used as an initial screening tool. Oxygen administration. Oxygen may be administered in addition to the mist tent. Oral and IV fluids. For patients with signs of dehydration, administer adequate oral or intravenous (IV) fluids; remember that pain may limit oral intake, complicating hydration maintenance in the patient. Antibiotics. Penicillin is the typical therapy for GABHS pharyngitis, in conjunction with prevention of dehydration and supportive care for pain. Antipyretics. Antipyretics are usually prescribed for mild fever and discomfort. Corticosteroids. Corticosteroids (e.g., dexamethasone) have been suggested as an adjunctive therapy to decrease pain and shorten symptom duration in adults with pharyngitis. A cold is often the parents’ first introduction to an illness in their infants. History of exposure. A history of exposure to known carriers, fever, headache, and abdominal pain in conjunction with a sore throat suggests group A beta-hemolytic streptococcal (GABHS) pharyngitis. History of intake. Because supportive care is a primary goal in all cases, historical information regarding oral intake and hydration status is important. Ineffective breathing pattern related to the inflammatory process in the respiratory tract. Ineffective airway clearance related to mechanical obstruction of the airway secretions and increased production of secretions. Anxiety related to the disease experienced by the child. Positioning. Place the child in a semi-Fowlers position using pillows to facilitate lung expansion. Increase fluid intake. Encourage increased fluid intake to decrease the viscosity of secretions. Increase room humidity. Increase the humidity by using cool mist vaporizers to relieve stuffiness of the nose. Administer medications. Administer antibiotics as prescribed after a positive culture result. The patient reported increased energy. The patient was able to expectorate sputum effectively. The patient expressed feelings of comfort in maintaining air exchange. The patient experienced no further signs or symptoms of infection. Inigo is diagnosed with “strep throat.” Which clinical manifestation would the nurse expect to the client? A fiery red pharyngeal membrane and fever. Pain over the sinus area and purulent nasal secretions. Foul-smelling breath and noisy respirations. Weak cough and high-pitched noise on respiration. Option A: Strep throat, or acute pharyngitis, results in a red throat, edematous lymphoid tissues, enlarged lymph nodes, fever, and sore throat. Option B: Pain over the sinus area and purulent nasal secretions would be evident with sinusitis. Option C: Foul-smelling breath and respirations indicate adenoiditis. Option D: A weak cough and high-pitched noisy respirations are associated with foreign-body aspiration. The pharmacist, physician, and nurse are all liable for the mistake. Option B: The physician, nurse, and pharmacist all are licensed professionals and share responsibility for errors. Options A, C, D: These options are incorrect. Group A beta-hemolytic streptococci (GABHS) infection if left unresolved or partially treated can lead to which of the following? Option D: Rheumatic fever is usually the result of untreated or poorly managed group A β-hemolytic streptococcal infections (GABHS), such as pharyngitis. Option A: Influenza is caused by viruses usually known as type A, B, and C. Option B: Sickle cell anemia is caused by a gene problem. Option C: Histoplasmosis is a pulmonary fungal infection caused by spores of Histoplasma capsulatum. A hospitalized 8-year-old client who has been receiving antibiotics for 10 days tells you that he is having frequent watery stools. Which action will you take first? Place the client on contact precaution. Instruct the client about correct handwashing. Obtain stool specimens for culture. Notify the physician about the loose stools. Option A: The client’s age, history of antibiotic therapy, and watery stools suggest that he may have Clostridium difficile infection. Options B, C, and D: The other actions are also needed and should be taken after placing the client on contact precautions. A newly admitted client with pharyngitis has been placed on droplet precaution. Which of the following statements indicates the best understanding of this type of isolation? The client can be placed in a room with another client with measles (rubeola). Must maintain a spatial distance of 3 feet. A special mask (N95) should be worn when working with the client. Gloves should be only worn when giving direct care. Option B: Droplets can travel no more than 3ft so precautions should be maintained when there is a possibility of entering this distance. Option A: Client requires a private room. Option C: An N95 mask is not required for this client. A face mask instead can be used when dealing with the client. Option D: Gloves, gowns, face mask and eye protection should be worn in giving direct care. 1. Inigo is diagnosed with “strep throat.” Which clinical manifestation would the nurse expect to the client? A. A fiery red pharyngeal membrane and fever. B. Pain over the sinus area and purulent nasal secretions. C. Foul-smelling breath and noisy respirations. D. Weak cough and high-pitched noise on respiration. 1. Answer: A. A fiery red pharyngeal membrane and fever. Option A: Strep throat, or acute pharyngitis, results in a red throat, edematous lymphoid tissues, enlarged lymph nodes, fever, and sore throat. Option B: Pain over the sinus area and purulent nasal secretions would be evident with sinusitis. Option C: Foul-smelling breath and respirations indicate adenoiditis. Option D: A weak cough and high-pitched noisy respirations are associated with foreign-body aspiration. A. Only the nurse’s—she should have checked the allergies before administering the medication. B. The pharmacist, physician, and nurse are all liable for the mistake. C. Only the pharmacist’s—he should alert the floor to possible allergic reactions. D. Only the physician’s—she gave the order, the nurse is obligated to follow it. 2. Answer: B. The pharmacist, physician, and nurse are all liable for the mistake. Option B: The physician, nurse, and pharmacist all are licensed professionals and share responsibility for errors. 3. Group A beta-hemolytic streptococci (GABHS) infection if left unresolved or partially treated can lead to which of the following? 3. Answer: D. Rheumatic Fever. Option D: Rheumatic fever is usually the result of untreated or poorly managed group A β-hemolytic streptococcal infections (GABHS), such as pharyngitis. Option A: Influenza is caused by viruses usually known as type A, B, and C.
Option B: Sickle cell anemia is caused by a gene problem. Option C: Histoplasmosis is a pulmonary fungal infection caused by spores of Histoplasma capsulatum. 4. A hospitalized 8-year-old client who has been receiving antibiotics for 10 days tells you that he is having frequent watery stools. Which action will you take first? A. Place the client on contact precaution. B. Instruct the client about correct handwashing. C. Obtain stool specimens for culture. D. Notify the physician about the loose stools. 4. Answer: A. Place the client on contact precaution. Option A: The client’s age, history of antibiotic therapy, and watery stools suggest that he may have Clostridium difficile infection. Options B, C, and D: The other actions are also needed and should be taken after placing the client on contact precautions. 5. A newly admitted client with pharyngitis has been placed on droplet precaution. Which of the following statements indicates the best understanding of this type of isolation? A. The client can be placed in a room with another client with measles (rubeola). B. Must maintain a spatial distance of 3 feet. C. A special mask (N95) should be worn when working with the client. D. Gloves should be only worn when giving direct care. 5. Answer: B. Must maintain a spatial distance of 3 feet. Option B: Droplets can travel no more than 3ft so precautions should be maintained when there is a possibility of entering this distance. Option A: Client requires a private room. Option C: An N95 mask is not required for this client. A face mask instead can be used when dealing with the client. Option D: Gloves, gowns, face mask and eye protection should be worn in giving direct care.